Our bomb will only be used in self defense. But the very existence of such a bomb will lead to an exodus of scared Israelis, that will bring an end to the Zionist regime. 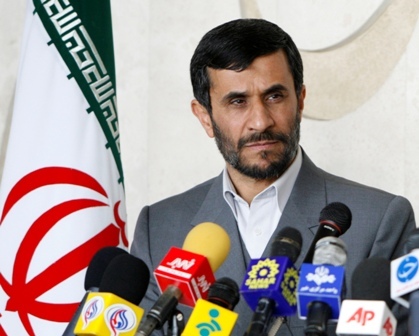 President Mahmoud Ahmadinejad is committed in his work for the destruction of the Zionist state. The Iranian website Asr-e Iran has posted an editorial stating that Iran possessing nuclear weapons will result in Israel’s elimination: Even if such weapons are never used. An Iran with nuclear weapons means an end to the dream of «secure Israel». This means the exodus of most of the residents of this occupied land (who immigrated there for absolute security and for jobs). This exodus will include human, financial, and other capital, and therefore will be a death sentence for this regime. The editorial was published on February 18th 2010. The editor explained that Israel’s raison d’être is the illusion that it can provide absolute security for the Jewish people, and that it has security supremacy. Once Iran possesses nuclear weapons and shifts the balance of power in the Middle East, it states, this will be end of Israeli society. When Adolf Hitler wrote «Main Kampf», he promised to «solve» the Jewish problem. But few people in free Western nations took Hitler `s threats at face value. The consequences of not dealing in time with Hitler, was a man made disaster called World War II. 60 million people perished, six million of them Jews slaughtered in gas chambers in Nazi-controlled Europa. The consequences of not taking the anti-Jewish remarks from Iran at face value, might lead to a massive Israeli first strike on Iran. After the Holocaust the state of Israel correctly established a zero tolerance policy towards political forces that gives the Jewish people their threat of extinction. Unfortunately for Israel, the same kind of hypocritical attitude the World presented to Hitler, is today present in regards to Iran in Washington, London and Moscow. Israel can not expect anything but massive condemnation if they act alone. Behold, people or Israel, you are not alone. God of Israel is with you, and Christians who believe that Jesus of Nazareth is His servant. Amen. I would have to say this is an excellent piece of work. I say this needs mentioning elsewhere. Shalom and Praise The LORD JESUS CHRIST. Shalom. You are herewith invited to make a summary of that article, and give your comment. If its good, I will make you a contributing editor.